Powers/Abilities: Presumably similar to the American Spider-Man - superstrength, agility, ability to stick to walls and ceilings, and webbing, either artificial or naturally produced. 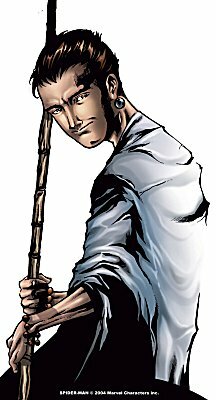 History: Young Pavitr Prabhakar was given superhuman powers by a mystic, which he used to battle demonic forces embodied by the likes of ruthless businessman turned Rakshasha Nalin Oberoi. Comments: Created by Stan Lee and Steve Ditko, then adapted for the Indian market by Sharad Devarajan (Gotham Entertainment's CEO) and Jeevan J. Kang (artist). Gotham Comics have for the last few years worked to bring many American titles (Marvel and DC primarily) to India and Singapore, translating them into a variety of local languages. There success with these reprints has led to plans for a brand new version of Spider-Man, dubbed a "transcreation", a reinvention designed to be more relevant to the Indian audiences. 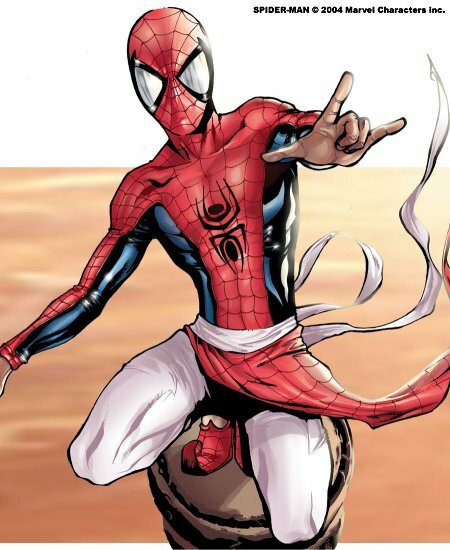 The launch of the character is scheduled to coincide with the release of Spider-Man 2 in the Indian cinema, with a four issue series initially scheduled. A translated edition was also released in the U.S. (and rest of the world) a few months later. Thanks to Dhruva Ghosh for additional information.